Our first Wednesday Evening Adult Discipleship Event is live! This is a brief post to help you find it and check it out. 1. If you haven't already, you can download the YouVersion Bible App. It is available on Apple and Android platforms. You can find the app here if you can't find it in your app store. It is also available on your computer if you wish to use that. 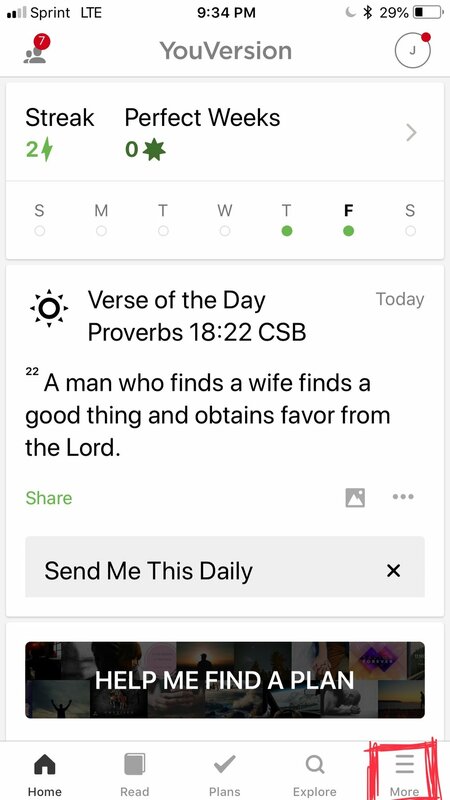 If you already have the app, make sure your YouVersion Bible app is updated. Once it is installed on your phone and updated, move on to the following steps. 4. Click on "Arbor Drive Community Church"
It's that easy. Within the event you can add prayer notes, see the scriptures that are being referenced, write notes, see lesson notes, see announcements for upcoming events at Arbor Drive. You can also share this event with your friends or use it if you want to go through the content we are going over on Wednesday evenings with a friend who wasn't able to make it, you family throughout the week, review with your spouse, or go through the content with a group as your own tool for discipleship. The ways that this can be used are only limited to your imagination. NOTE: The next day, the event will be taken down so be sure to access and "save" the event if you want to keep it in your YouVersion profile. Each event will be available 5 days before we gather (so on Friday evening). Be sure to give us feedback and let us know if this is helpful to you. We hope this blesses you and is useful to you. Over the last couple of weeks, I have been doing some research to find out how to maximize out Wednesday Evening Adult Discipleship time (you can read about that here). As I was working on this, I ran across an amazing fact. The YouVersion Bible app is the most popular Bible app in the world with over 86 million downloads. I decided to test this out and posted on our Facebook page asking who used it. Seems that a lot of us do, which is really good because YouVersion has some features that will help Wednesday evenings be even more beneficial. So... Starting this next week, we will be integrating YouVersion into our Wednesday Night Adult Discipleship. Each week, there will be an "event" that is posted that will have space for you to write down prayer notes from our time in prayer together as well as notes during our time together and an outline/teacher notes. All of these can be saved right to your app for you to use later or go back through during the week. To access this, open your YouVersion app and then click on "more" in the lower right hand corner. You will see an option called "events". 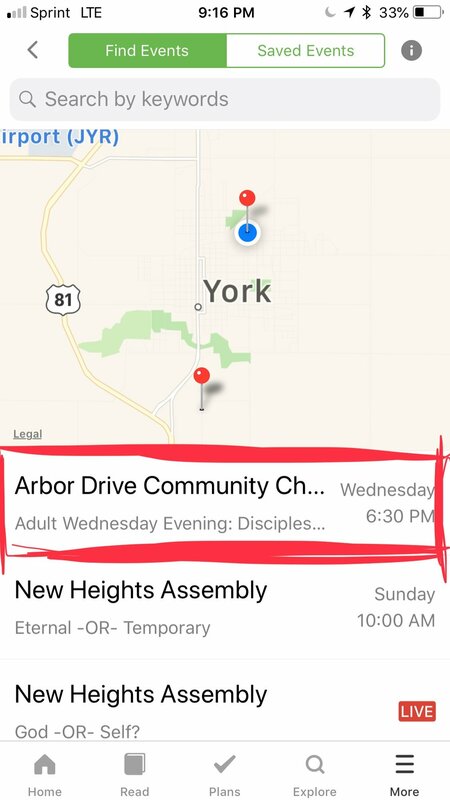 Click on that and then click on the Arbor Drive Community Church event. You can then make notes and save the event to your app. The events will be available 4 days before each Wednesday and then for a day after before they disappear. Once you have saved your notes though, they stay on your app. It's that easy. Throughout the next few weeks as we get this going, please be sure to let us know how we can improve it and make it more useful to you.